When judges and court personnel receive honors or acclaim for their contributions to the branch, please share that information with OSCA Publications. Judge Nina Ashenafi-Richardson, Leon County, is the recipient of the 2019 Distinguished Judicial Service Award. The award honors outstanding and sustained service to the public, especially as it relates to support of pro bono legal services: in addition to the demands of her court docket, Judge Ashenafi-Richardson averages 15 to 25 hours a week in service to various legal or judicial programs, organizations, and statewide committees. Judge Martin Bidwill, Seventeenth Circuit, received the Judge of the Year Award from the Fort Lauderdale Chapter of the American Board of Trial Advocates, whose mission is to uphold the jury system by educating the American public about the history and value of the right to trial by jury; Judge Bidwell, who has been on the bench since 2005, was honored for his many years of hard work as a jurist. Judge Alice Blackwell, Ninth Circuit, was recognized as the 2018 Champion of Justice by Harbor House; this award recognizes leaders in the Central Florida community who work towards ending violence and creating lasting, positive change in the lives of domestic violence survivors. Judge Patricia A. Doherty, Ninth Judicial Circuit, received the 2018 Trial Judge of the Year Award from the Central Florida Chapter of the American Board of Trial Advocates. Judge Samantha Schosberg Feuer, Fifteenth Judicial Circuit, was awarded the Distinguished Jurist Award by the Palm Beach County Chapter of the Florida Association of Women Lawyers. Chief Judge Ronald Ficarrotta, Thirteenth Judicial Circuit, is the recipient of the 2018 Luis "Tony" Cabassa Award for his extraordinary contributions to the Tampa Hispanic Bar Association. Chief Judge Frederick Lauten, Ninth Circuit, received the 2019 James G. Glazebrook Memorial Bar Service Award by the Orange County Bar Association; this award is presented to a state or federal jurist who best demonstrates service to and support of the legal profession. Judge Janeice Martin, Collier County, was honored with the 2018 Murray Hendel Civic Achievement Award by the Collier Citizens Council; she was distinguished for her extraordinary contributions to the community, particularly for running all three Collier County Treatment Courts—drug, mental health, and veterans courts—in addition to carrying a full caseload as a county court judge. Retired Justice Peggy A. Quince was distinguished by the Tampa Bay Inn of Court with its first award of honorary lifetime membership; she was also recognized as one of the Inn’s founding members and one of its early presidents. Judge Maria Sampedro-Iglesia, Eleventh Judicial Circuit, received the 2018 William E. Gladstone Award. Presented by the Florida Department of Children and Families, this award is named after the late Eleventh Circuit Judge William E. Gladstone for his pioneering work in the placement, motivation, treatment, and education of the delinquent and abused, abandoned, or neglected children who came before him. It is presented each year to the greatest contributor to the protection and well-being of Florida's most vulnerable children. Chief Judge Bertila Soto and Ms Rene Tew, assistant general counsel, Eleventh Judicial Circuit, were honored with 2019 Women of Impact Awards, titled “Visionary Women: Champions of Peace and Nonviolence.” These awards, presented in March each year in celebration of Women’s History Month, are sponsored by the Women’s History Coalition of Miami-Dade County, Inc.
Mr. Craig Waters, director of the Florida Supreme Court’s Public Information Office, was distinguished with the Pete Weitzel/Friend of the First Amendment Award, created to recognize the significant contribution made by Pete Weitzel—former managing editor of The Miami Herald and founder and past president of the First Amendment Foundation—in support of open government. Given annually to someone in Florida who has made a significant contribution to the cause of furthering open government, the Weitzel Award honors Mr. Waters for his tireless efforts as the public face in the weeks following the 2000 election. Judge Robert Branning, Twentieth Judicial Circuit, was awarded the Trailblazer of the Year by theNews-Press; given to someone who has built a pathway of success for others through innovation, determination, and commitment, this award was presented to Judge Branning for his work piloting the therapy dog program in Lee County dependency court. Judge Melinda Brown, Broward County, was honored with a Community Service Award from the Jewish Community Center of Plantation, which recognized her for her work with the Jewish Community Center Board, Make-A-Wish Foundation, Broward Children’s Center, Florida United Methodist Children’s Home Advisory Board, and the Broward Crime Commission Advisory Board. Judge Pamela Campbell, Sixth Judicial Circuit, was honored with the Jurist of the Year award by the Florida Chapter of the American Board of Trial Advocates. Judge Dawn P. Fields, Volusia County, was awarded Woman of the Year by the Volusia Flagler Association for Women Lawyers. Judge Jack Helinger, Sixth Judicial Circuit, was given the William Castagna Award for Judicial Excellence by the Barney Masterson Inn of Court, a legal organization whose mission is to promote civility and ethics in lawyer-to-lawyer and lawyer-to-judge relations. In addition, Judge Helinger was recognized by the Clearwater Bar Association with a John U. Bird Judicial Excellence Award, created to recognize honor, high ideals, personal character, judicial competence, and service. He was also presented with a Judicial Professionalism Award by the Women Lawyers of Pasco County; this award recognizes a jurist's continuing efforts to foster a relationship between the bench and the bar and to encourage those who practice law to maintain high ethical standards and to present themselves as models of civility and patience for others to emulate. Judge Debra L. Krause, Seminole County, received the Seminole County Bar Association’s Judge of the Year Award. Judge Cindy Lederman, Eleventh Judicial Circuit, was distinguished with the 2018 Janet Reno Women’s Leadership Award; coordinated by the Center for Juvenile Justice Reform at Georgetown University, this award is given to a nominee who has demonstrated a commitment and ability to effect change in her community or organization to benefit youth, particularly those at-risk of entering the juvenile justice or child welfare systems. Among other achievements, Judge Lederman was recognized for serving in the Miami-Dade Juvenile Court since 1994; leading the team that created the Domestic Violence Court; developing a special docket for drug-involved mothers of newborn babies; issuing a groundbreaking ruling that paved the way for adoption by gay and lesbian couples in Florida; and founding the Girls Advocacy Project, an award-winning intervention for girls in the Juvenile Detention Center in Miami-Dade. Judge Janeice Martin, Collier County, was distinguished with an American Legion Award. Judge Edward H. Merrigan, Jr., Seventeenth Judicial Circuit, who serves in the Army Reserves, was recently promoted to Brigadier General; the promotion ceremony was held at the Judicial Complex in Broward County. Judge Kelly J. McKibben. Eighteenth Judicial Circuit, was presented with the 2018 Outstanding Jurist of the Year Award by the Florida Association for Women Lawyers; this award recognizes jurists who have consistently, fearlessly, and impartially promoted the rule of law, respecting the equal rights of all who come before them. Magistrate Gil Perez, Twentieth Judicial Circuit, was awarded the Gavin Letts Memorial Jurist of the Year Award for 2018 by the Florida Chapter of the American Academy of Matrimonial Lawyers; this award is presented for the most outstanding contribution to the field of matrimonial law by a member of the judiciary. Mr. Steve Simon, Ninth Judicial Circuit, head of the circuit’s Project Management Team, received the Arnie Wilkerson Memorial Court Service Award from The George C. Young American Inn of Court; this award honors individuals working in the judicial system who display the highest standards of character, integrity, and ongoing dedication to the judicial system. Chief Judge Bertila Soto, Eleventh Judicial Circuit, received the Johnnie M. Ridgely President's Award,created by the Dade County Bar Association in 2005 to honor Johnnie Ridgely's life and commitment to service during her more than 42 years as executive director of the organization. Mr. Joseph Stelma, Jr., Trial Court Administrator with the Fourth Judicial Circuit, was selected for the Jacksonville Bar Association’s 2018 Liberty Bell Award, presented annually to a non-attorney who has made a significant contribution to the legal system in Northeast Florida. Judge Joseph M. Williams, Baker County, received the Harvey Ford Award, the highest honor of the Conference of County Court Judges of Florida, in recognition of his service to the community, the legal profession, and the conference. The Office of the State Courts Administrator recognizes the outstanding work performed by its employees. A number of those exceptional employees have been honored for their efforts. Congratulations to all the recipients of OSCA awards. 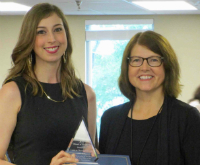 The Bright Beginning Award is presented to an employee who has worked at the Office of the State Courts Administrator for two years or fewer but has already made significant contributions. The selected nominee is dedicated, hardworking, helpful, and eager to learn about the judicial branch. The 2018 Bright Beginning Award recipient is Kelsey Harper, a member of the Resource Planning and Support Services unit since October 2017. She is pictured here on the left, receiving her award from State Courts Administrator PK Jameson. Kelsey’s nomination said she is a conscientious worker who has the ability to quickly understand the wide-ranging and complex issues assigned to the Resource Planning Unit. In her first six months, Kelsey attended 48 committee, commission, and workgroup meetings, and she was responsible for providing analysis and presentations in many of those meetings. The Spirit Award is presented to an individual who enhances the work environment. The employee is joyful, encouraging, supportive, and friendly, and makes the office a better place. 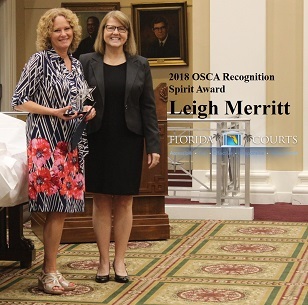 The 2018 Spirit Award recipient is Leigh Merritt, a member of the Office of Court Improvement. She is pictured here on the right, receiving her award from State Courts Administrator PK Jameson. Her nomination said Leigh “often adds special and finishing touches to every project, training, meeting and gathering – from helping arrange networking opportunities to supporting colleagues who are making presentations to bringing in a centerpiece for the table. Leigh’s nomination also noted she is quick with praise and valued feedback following meetings and other events, as well as a penchant for encouraging messages left on white boards around the office. The Almanac of Court Expertise (A.C.E.) Award recognizes an individual who possesses a wealth of knowledge and skills and is willing to share those with others. One can always count on this employee to have the answer to questions. The 2018 A.C.E. Award recipient is Ann Luchini (pictured left with State Court Administrator PK Jameson) who works in Court Education. Here is an excerpt from her nomination. Ann’s nomination described her as conversant in matters relating to budget, travel policy, Florida Court Education Council policy, education program details, venue selection, and hotel negotiations. The Team Work Award recognizes a team or an individual who displayed team spirit and a willingness to make personal sacrifices for the good of the team. This year, team work awards were conferred to a multi-person team. The 2017 Team Work Award recipient is the Court Education Team. 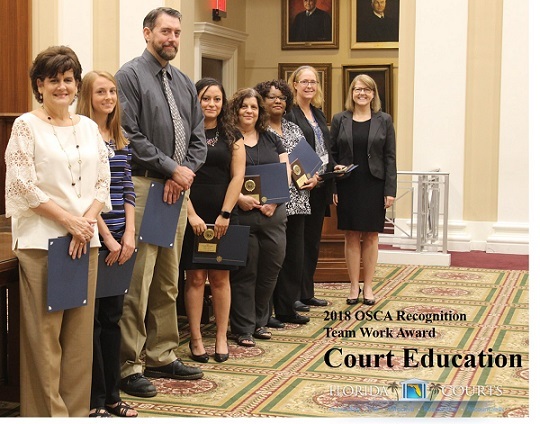 They are, pictured from left, Cathy Brockmeier, Haylee Brown, Dan Rettig, Paola Pana, Ann Luchini, Danita Johnson, and Rose Patterson being presented their awards by State Courts Administrator PK Jameson. Not pictured, but a member of the recognized team, is Madelon Horwich. Congratulations to the Court Education team. 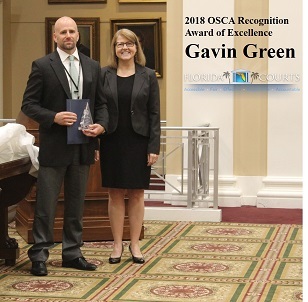 The Award of Excellence recognizes an employee whose contributions throughout the entire year assisted the OSCA in fulfilling its mission to the judicial system. Such contributions may include exemplary customer service, outstanding productivity, increased work force unity, or cost savings. The Adult Post-Adjudicatory Drug Court Expansion Program Team—Ms Jennifer Grandal, Mr. Aaron Gerson, Mr. Chris Korn, and Mr. Joshua Kuch of OSCA’s Office of Court Improvement—was awarded a 2018 Prudential Productivity Award, conferred by Florida Taxwatch. The expansion program—which identifies and diverts eligible felony offenders with diagnosed substance use and/or mental health disorders into drug court to obtain community-based treatment services, helping them break the cycle of addiction and incarceration and become productive members of their community again—was recognized for saving the state millions of dollars in avoided prison costs. Judge Nina Ashenafi-Richardson, Leon County, received the 2018 Parks & Crump Thurgood Marshall Award for Judicial Excellence. Judge Alice L. Blackwell, Ninth Judicial Circuit, was honored with a Women Business & Commercial Advocates Award by the American Bar Association; she was praised for having “distinguished herself in her nearly 40 years as an attorney and Judge by her intellect, demeanor, and many contributions to the advancement of women in our profession." Judge Joe Boatwright, Putnam County, was recently selected as the editor in chief for Judicature, a scholarly law journal published by Duke University School of Law and distributed throughout the country. Judge Robert Branning, Twentieth Circuit, was chosen for the News-Press Trailblazer of the Year Award for introducing and piloting the circuit’s therapy dog program in dependency court. Judge John C. Cooper, Second Circuit, was presented with the 2017 Jurist of the Year Award from the Tallahassee Chapter of the American Board of Trial Advocates. Judge Miguel M. de la O, Eleventh Circuit, received the Maxine Cohen-Lando Community Service Award from Transition, Inc., an organization that helps individuals released from prison or jail in South Florida become self-sufficient, law abiding citizens by providing treatment, housing, and job placement services, with the goal of reducing crime and recidivism in the community; he was honored for his leadership on the bench and his support for Transition. Judge Janeice Martin, Collier County, was recognized by the National Alliance on Mental Illness of Collier County as the 2017 Mental Health Advocate of the Year; she was chosen for her support in getting funding for comprehensive mental health treatment in the community and for her steadfast commitment to improving the lives of those living with mental illness. Judge Vance E. Salter, Third District Court of Appeal, received the 2018 Distinguished Judicial Service Pro Bono Award, presented by Chief Justice Jorge Labarga at the Florida Supreme Court. This award was in recognition of Judge Salter’s outstanding and continuous support of, contribution to, and commitment to pro bono services and the community as a whole. Judge Margaret Steinbeck. Twentieth Circuit, was named 2017 Southwest Florida American Board of Trial Advocates Jurist of the Year; she was chosen for her years of public service, her work to improve the courts system, and her unwavering commitment to justice. Retired Justice Charles T. Wells, who served on the Florida Supreme Court bench from 1994 – 2009, was presented with a Lifetime Achievement Award by the Florida Court Public Information Officers. As chief justice when the September 11 tragedy struck, he established a workgroup to “develop a plan for the State Courts System to better respond to emergency situations.” In response to the workgroups recommendations, he directed each chief judge to designate a court staff member to serve as the court’s public information officer, responsible for coordinating emergency response activities and providing information to, and answering questions from, the media and the public. Chief Judge Raul A. Zambrano, Seventh Judicial Circuit, published a tribute to Judge Kim Hammond, Seventh Judicial Circuit (on the bench from 1979 – 2010) in the spring edition of Judicature; Judge Hammond passed away in 2017. Judge Lee E. Haworth (ret. ), Twelfth Judicial Circuit, received the McKaig Award from the Sarasota County Bar Association, honoring him for his tireless advocacy for meaningful and effective increases in access to justice for the disadvantaged and for his efforts to educate lawyers and the public, thus enhancing the image of the legal profession. Mr. Leonard Helfand, Second Judicial Circuit, received a 2017 Award of Appreciation from Florida’s Dispute Resolution Center for his role in initiating the formal celebration of Mediation Day in Florida (the first was in 1996), which spurred a global movement to celebrate methods of peacemaking. Judge Norma S. Lindsey, Third District Court of Appeal, was honored with a Judicial Lifetime Achievement Award by the Dade County Bar Association, recognizing her many years of service as a county court, circuit court, and DCA judge. Judge Patt Maney, Okaloosa County, was distinguished with the Governor’s Medal of Merit for his work on veterans issues in Florida, including his tireless advocacy for Veterans Treatment Courts in the First Circuit and throughout the state. He was previously recognized by lawmakers in 2012: the T. Patt Maney Veterans Treatment Intervention Act authorized the establishment of veterans courts to address the substance use disorders and mental health needs of veterans who become involved in Florida’s criminal justice system. Florida now has 30 veterans courts. Ms Viviana Mendiola, Eleventh Judicial Circuit, a case manager at the Lawson E. Thomas Courthouse Center in Miami, published an article about pro se litigants and Florida courts, titled “Observations on Floridians’ Access to Civil Justice,” in the Summer/Fall 2017 edition of CABA Briefs, the Cuban American Bar Association magazine (see p. 23). Justice Barbara Pariente, Florida Supreme Court, received the Sandra Day O'Connor Jurist Award by the American College of Trial Lawyers, given to a judge in the US or Canada who has demonstrated exemplary judicial independence in the performance of his or her duties, sometimes in especially difficult circumstances. Judge Michael Robinson, Seventeenth Judicial Circuit, received the Judicial Distinguished Service Award from the Florida Council on Crime and Delinquency. Judge Jose R. Rodriguez, Ninth Judicial Circuit, received an award from the Orange County Bar Association Estates, Guardianship, and Trust Committee, recognizing his visionary guidance and tireless dedication to the Probate, Guardianship, and Mental Health Division of the Ninth Circuit. Judge Mark Speiser, Seventeenth Judicial Circuit, was honored by the Broward County Crime Commission with the 2017 Outstanding Career Service Award for his lifetime of service to Broward County. Ms Elizabeth “Betty” White, Fifth Judicial Circuit, was recognized posthumously with a 2017 Award of Appreciation from Florida’s Dispute Resolution Center for being a “passionate supporter of peaceful conflict resolution, especially of conflicts involving families and children.” Ms White was the Fifth Circuit’s alternative dispute resolution director and then its director of case management. Mr. Stephen Woodin, Sr., Seventh Judicial Circuit, a Florida Supreme Court certified county mediator and director of the Flagler Mediation Center, was honored with a Presidential Volunteer Service Award for his contributions to the field of mediation. Judge Bruce Anderson, Fourth Circuit, has achieved board certification in civil trial law from The Florida Bar. Established in 1982 by the Florida Supreme Court, “board certification recognizes attorneys’ special knowledge, skills, and proficiency in various areas of law and professionalism and ethics in practice”; this designation helps consumers identify specialists in various areas of law. Judge Hope T. Bristol, Seventeenth Circuit, was honored with the 2017 William E. Gladstone Award; conferred annually by the Florida Department of Children and Families, this prestigious award recognizes her for her judicial leadership and service to Florida’s children. Judge Jim Earp, Eighteenth Circuit, received the 2017 Distinguished Service Award from the Florida Council on Crime and Delinquency; this award recognizes him for his leadership and for his use of technology to improve the speed and efficiency of the court system. Chief Judge Ronald Ficarrotta, Thirteenth Circuit, received the Jurist of the Year Award from the Florida Chapters of the American Board of Trial Advocates. 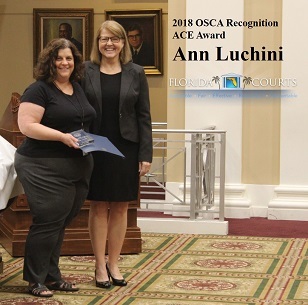 This award is given to a judge who demonstrates a strong commitment to preserving and improving the jury trial system; exhibiting professionalism, knowledge and preparedness in the courtroom; and maintaining an open and accessible working relationship with the trial bar. Judge Dawn Fields, Volusia County, was honored with the 2017 Elected Official of the Year Award by the Volusia/Flagler chapter of the National Association of Social Workers. Judge William Haury, Seventeenth Circuit, received the Broward County Bar Association’s President's Award, given "in recognition and appreciation for your outstanding commitment, loyalty and service to the bar and legal community." Judge Claudia Isom, Thirteenth Circuit, received the Outstanding Jurist Award from The Florida Bar’s Young Lawyers Division; the award honors her for promoting and contributing to the improvement of the legal system and the administration of justice, for her dedication to educate Florida’s youth and at-risk youth, and for promoting local pro bono legal services. Judge Steve Jewett, Ninth Circuit, was selected for the 2017 Judge of the Year Award; presented by the supreme court’s Justice Teaching initiative, the award honors the judge who most accurately embodies the spirit of Justice Teaching in delivering civic education to the children of Florida. Judge Jewett is actively involved in education programs for students aspiring to be attorneys, such as the Florida High School Mock Trials. Judge Robert Paul LeBlanc, Ninth Circuit, received the William M. Hoeveler Judicial Professionalism Award from The Florida Bar’s Standing Committee on Professionalism; the award recognizes an active judge who best exemplifies strength of character, service, and competence as a jurist, lawyer, and public servant, and who has communicated his/her dedication to the ideals of justice and demonstrated diligence in inspiring others to the mission of professionalism. Judge Jacqueline Hogan Scola, Eleventh Circuit, was honored with the Jurist of the Year Award by the Florida Association for Women Lawyers; this annual award recognizes state and federal jurists for distinguished careers on the bench, as well as contributions to the community and the practice of law. Judge Gilbert Smith, Twelfth Circuit, was presented with the William C. Grimes Lifetime Achievement Award by the Manatee County Bar Association. Chief Judge Bertila Soto, Eleventh Circuit, was distinguished with the Judge Rosemary Barkett Women of Distinction Judiciary Award; presented by the Dade County Bar Association, this award recognizes the role of women in the legal profession and the community. Judge Peter M. Weinstein, Seventeenth Circuit, received the Broward County Bar Association’s Executive Director's Award, given "in recognition and appreciation for your outstanding commitment, loyalty and service to the bar and legal community." He was also honored by the United Way of Broward County and MISSION UNITED for his leadership and commitment to serving US veterans, most notably for his role in establishing a veterans court in the Seventeenth Circuit. Judge Augustus Aikens, Leon County, was presented with the 2017 Richard W. Ervin Equal Justice Award; an annual honor presented by the Capital City Bar Presidents Council, this award recognizes an individual who has made significant contributions to the legal justice system in Florida. Judge Aikens was honored for being fair and thoughtful, for his dedicated and distinguished service, for the dignity and respect with which he treats all litigants, and for his learned contributions as teaching faculty for Florida Judges. Senior Judge W. Douglas Baird, Sixth Circuit, was distinguished with the Clearwater Bar Association’s George W. Greer Judicial Independence Award. Judge Linda Babb, Sixth Circuit, was selected for the 2017 Judicial Professionalism Award by the Women Lawyers of Pasco; among other things, she was recognized for encouraging those who practice law to maintain high ethical standards. Judge Thane Covert, Sixth Circuit, received the William J. Castagna Award for Judicial Excellence from the Barney Masterson American Inn of Court; he was honored for displaying the highest standards in all aspects of judicial performance, including knowledge of the law, ethics, civility, professionalism, and demeanor. Judge Ron Flury, Leon County, was presented with the 2017 Parks and Crump Thurgood Marshal Award for Judicial Excellence; an annual honor, this award recognizes Judge Flury’s leadership and professional excellence. Judge John D. Galluzzo, Eighteenth Circuit, was honored by the Florida Council on Crime and Delinquency with a Distinguished Service Award; the award is "In recognition of your outstanding contributions to our communities and those you serve in the criminal justice field." Judge Keith R. Kyle, Twentieth Circuit, was named Jurist of the Year by the Southwest Florida Chapter of the American Board of Trial Advocates. Judge Patrice Moore, Sixth Circuit, was honored with the Judicial Appreciation Award by the St. Petersburg Bar Association; in selecting the award recipient, the association considers factors such as courtroom demeanor, judicial experience, helpfulness to lawyers and litigants, and activities off the bench that promote the administration of justice and civic participation. Judge Christopher N. Patterson, Fourteenth Circuit, was recognized as the 2017 Judge of the Year by Justice Teaching, the statewide law-related education initiative established by Justice R. Fred Lewis in 2006 that aims to partner a legal professional with every elementary, middle, and high school in the state. Judge Nushin Sayfie, Eleventh Circuit, was presented with an In the Company of Women: Outstanding Woman in Government and Law Award 2017 for her service, leadership, and contribution to women; this award was presented by the Miami-Dade County Commission for Women, the Parks Foundation of Miami-Dade, and the Miami-Dade Parks, Recreation and Open Spaces Department. Judge Walter L. “Skip” Shafer, Sixth Circuit, was posthumously given the John U. Bird Judicial Excellence Award; presented by the Clearwater Bar Association, this award was created to recognize honor, high ideals, personal character, judicial competence, and service. Judge Angelica Zayas, Eleventh Circuit, was presented with an In the Company of Women: Outstanding Woman in Government and Law Award 2017 for her service, leadership, and contribution to women; this award was presented by the Miami-Dade County Commission for Women, the Parks Foundation of Miami-Dade, and the Miami-Dade Parks, Recreation and Open Spaces Department. She also received the Women of Impact Award for her professional accomplishments; presented by the Women’s History Coalition, this award honors trailblazing women in labor and business. 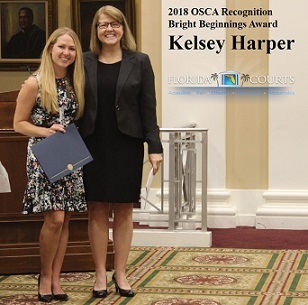 The Bright Beginning Award is presented to an employee who has worked at the Office of the State Courts Administrator for two years or fewer but has already made significant contributions. The 2017 A.C.E. 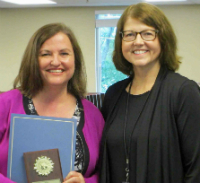 Award recipient is Debbie Howells (pictured left with State Court Administrator PK Jameson) who works in the Administrator’s office. Here is an excerpt from her nomination. The Team Work Award recognizes a team or an individual who displayed team spirit and a willingness to make personal sacrifices for the good of the team. This year, team work awards were conferred to both an individual and a multi-person team. The 2017 Team Work Award individual recipient is Patty Sharp (pictured right with State Court Administrator PK Jameson) in Innovations and Outreach. Here is an excerpt from her nomination. The 2017 Team Work Award team recipient is The Move Team (pictured below l-r), consisting of Freddy Menendez, Marco Vasquez, Josh Hough, Scott Higgins, Susannah Davis, Steven Hall, Arlene Johnson, Ann Luchini, (with State Court Administrator PK Jameson), Steve Updike, Alan Neubauer, Perrone Ford, Andrew Johns, Jimmy Beasely, (not pictured) Andru Athens, Karl Gray, Jacqueline Settles, Jenna Rogers, John Cary, and Kimberly Kosch. Florida courts personnel are again being recognized for their great work, serving the mission of the State Courts System and the people of Florida. Winners of 2017 Prudential Productivity Awards will be honored in June. Since 1989, the awards program has recognized and rewarded state employees and work units whose work significantly increases productivity and promotes innovation to improve the delivery of state services and save money for Florida taxpayers and businesses. Judge Maryann Boehm, Sarasota County, immediate past president of the Judge John M. Scheb American Inn of Court in Sarasota, was presented with the Platinum Award at the American Inn of Court Awards Gala in Washington, DC. Judge Lauren L. Brodie, Twentieth Circuit, was honored by the Lee County Association for Women Layers at its 2016 Judicial Appreciation Reception. She was recognized for having been named the 2015 Woman Lawyer of the Year by the Collier County Women’s Bar Association (for displaying excellence in her career, overcoming stereotypes, and promoting the status of women in the legal profession) as well as the 2015 Extraordinary Woman Leader in the State of Florida by the Florida Association for Women Lawyers (for her dedication and commitment in creating, and serving as first president of, Drug Free Collier). General Magistrate Robert J. Jones, Eleventh Circuit, was distinguished with The Florida Bar Family Law Section’s Honorable Raymond T. McNeal Professionalism Award and with its first ever Trailblazer Award. The Professionalism Award recognizes his passionate service on the Executive Council of the bar’s Family Law Section, performed with exemplary professionalism and with courtesy towards those with whom he served. And the Trailblazer Award recognizes his many years of service to the Family Law Section and lauds him for being a tireless voice for Florida’s families, for championing general magistrates and child support hearing officers, for contributing to legislation and judicial education, and for helping to improve Florida’s judicial system. Judge Virginia Baker Norton, Fourth Circuit, was presented with the 2017 Distinguished Judicial Service Award; an annual honor given by The Florida Bar, this award recognizes an active or retired judge “for outstanding and sustained service to the public, whether through legal or civic service or a combination” of both. Judge Erika N. Quatermaine, Sarasota County, was presented with the 2016 National Association for the Advancement of Colored People Award for Public Service, presented by the Sarasota County Branch of the NAACP. Justice Peggy Quince was inducted into the Hall of Fame of Stetson University College of Law. Justice Quince, who has served on Florida’s high court for 18 years, is the first African-American woman to be appointed both to the Florida Supreme Court and Florida District Court of Appeal—and the first to lead a branch of government in Florida, serving as chief justice of Florida’s judicial branch from 2008 – 2010. She has been honored with dozens of awards, including a Lifetime Achievement Award and a Margaret Brent Women Lawyers Achievement Award, and she is a member of the Florida Women’s Hall of Fame. Judge Belle Schumann, Volusia County, was named Jurist of the Year by the Volusia/Flagler Association of Women Lawyers. She was also the local chapter’s nominee for the statewide Jurist of the Year Award. Judge Tyrie Boyer, Fourth Circuit, was honored with the Jurist of the Year Award from the Florida chapter of the American Board of Trial Advocates. The Florida Dispute Resolution Center (DRC) proudly announces the award recipients recognized at this summer’s 24th annual conference. Kathleen O. Reuter received the Sharon Press Excellence in Alternative Dispute Resolution Award for her visionary leadership, professional integrity, and unwavering devotion to the field of alternative dispute resolution; Ms. Reuter was honored for having been one of two mediators selected to serve in a supreme court workgroup established to develop recommendations for an operational plan for ADR programs in Florida’s trial courts, and for having led the effort to base mediator certification on points rather than strictly on educational degrees or Florida Bar membership. Beth Greenfield-Mandler, Esquire, received the DRC’s Award of Appreciation for her eight years of service to the Mediation Ethics Advisory Committee; in addition, Ms Greenfield-Mandler was recognized for having been one the three chairpersons the committee has had in its 22-year existence. Also, Mike Nichols, a county mediator from the Northern Division, received the DRC’s Award of Appreciation for his eight years of service to the Mediation Ethics Advisory Committee and for his continued commitment to the tenets of alternative dispute resolution. Judge Mark W. Klingensmith, Fourth DCA, earned a Master of Laws degree (LLM) in Judicial Studies from Duke University School of Law. Judge Robert Lee, Broward County, was presented with a Chief Justice Award for Judicial Excellence, which recognizes one county court judge and one circuit court judge who personify judicial excellence and demonstrate exceptional commitment to the judicial branch. Appointed to the Broward County bench in 1997, Judge Lee is called “a dedicated individual who has worked tirelessly towards improving our legal system and educating the public that he serves.” Judge Lee’s accom­plishments are far-ranging, but his achievements in two areas especially stand out: he has authored numerous informational and educational guides to support the work of his fellow judicial and quasi-judicial officers, and he has created several innovative court programs and initiatives to improve the administration of justice. Judge Robert Morris, Second DCA, earned a Master of Laws degree (LLM) in Judicial Studies from Duke University School of Law. Judge Virginia Baker Norton, Fourth Circuit, earned a Master of Laws degree (LLM) in Judicial Studies from Duke University School of Law. Judge Vance E. Salter, Third DCA, was selected by the Dade County Bar Association as the recipient of the Justice Joseph Story Award. This award recognizes Judge Salter’s work with law students and practitioners to improve legal assistance to those unable to afford private counsel: for instance, he co-chaired The Florida Bar’s Pro Bono Legal Services and served on the Access to and Delivery of Legal Services Subcommittee of the Florida Commission on Access to Civil Justice. In addition, he is a member of the board of directors of The Learning Experience School, a non-profit school for children and young adults with disabilities. Judge Alice L. Blackwell, Ninth Judicial Circuit, was honored with the James G. Glazebrook Professionalism and Service Award from The George C. Young American Inn of Court; the award honors a current or former Inn member (including lawyers and judges) whose combination of service to the Inn and professionalism and integrity in practice display a course of excellence. Judge Shawn Crane, Sixth Circuit, was the recipient of the annual Judicial Professionalism Award granted by the Pasco chapter of the Florida Association for Women Lawyers. The award recognizes a local judge who best exemplifies service to the community, profession, and legal system and who has demonstrated diligence in inspiring others to the mission of legal professionalism. Judge Jack Day, Sixth Circuit, received the Judicial Appreciation Award, conferred by the St. Petersburg Bar Association. Among the factors the association considers are the nominee’s courtroom demeanor, his or her judicial experience, helpfulness to lawyers and litigants, and activities off the bench that promote the administration of justice and civic participation. Judge Renee Goldenberg, Seventeenth Circuit, was presented with the Florida Association of Women Lawyers 2016 Jurist of the Year Award; this award, established in 2015, recognizes jurists who have “consistently, fearlessly, and impartially promoted the rule of law respecting the equal rights of all” who come before them. Judge Jack Helinger, Sixth Circuit, was recently awarded the 2015 Canakaris Award for Judicial Excellence in Family Law. The award is presented by the Canakaris Inn of the Court, a group of area lawyers and judges whose mission is to promote professionalism and legal excellence in the practice of family law. Retired Judge Raymond McNeal, Fifth Judicial Circuit, was honored with the Richard D. Custureri Pro Bono Service Award from Community Legal Services of Mid-Florida. Conferred upon a local Florida Bar member for outstanding pro bono outreach, this award recognizes Judge McNeal’s service to the organization and to his church’s homeless program; currently blending these two interests, he is now working with Community Legal Services to establish a homeless legal advice clinic. Judge Edward Nicholas, Twelfth Circuit, received the 2016 Manatee County Bar Association’s Community Service Leader Award; this award honors members of the bar association who provide service to the community through participation in organizations and activities beyond the scope of the bench. Retired Judge Frank A. Orlando, Seventeenth Judicial Circuit, was selected for induction into the University of Florida’s College of Health and Human Performance Alumni Hall of Fame. He is being honored for a host of accomplishments; among them, since retiring from the bench, he has been instrumental in introducing juvenile detention reforms in Florida; has coordinated technical assistance for the Annie E. Casey Foundation for Juvenile Detention Alternatives Initiative; and has served as the director of the Center for the Study of Youth Policy at Nova Southeastern University School of Law. Judge James Pierce, Pinellas County, was honored by Fresh Start Innovative Mentoring, a non-profit organization that matches mentors with teens and adults on probation, for “exemplifying extraordinary service to the community.” Among other accomplishments, he was recognized for starting Boys Court: an effort to steer wayward youth to productive lives through the use of motivational speakers, mentors, journaling, community service, and close monitoring. Judge Steven Rogers, Fifth Circuit, was recognized as the 2016 Justice Teaching Select Committee Judge of the Year by Justice Teaching, the statewide law-related education initiative established by Justice R. Fred Lewis in 2006 that aims to partner a legal professional with every elementary, middle, and high school in the state. Judge John Schaefer, Sixth Circuit, was selected for the John U. Bird Judicial Excellence Award by the Clearwater Bar Association; the award was created to recognize a local judge for his or her honor, high ideals, personal character, judicial competence, and service. Judge Nina Ashenafi-Richardson, Leon County, received the Tallahassee Bar Association’s inaugural Martha Barnett Women Lawyers of Achievement Award, which was established to recognize and celebrate the accomplishments of women lawyers from the Second Judicial Circuit. Amy Borman, General Counsel with the Fifteenth Circuit, is the 2016 recipient of the annual Palm Beach County Bar Association’s Sidney A. Stubbs Professionalism Award—the highest honor for professionalism bestowed within the circuit. Judge James McGarity, Collier County, was inducted into the US Army Officer Candidate School Hall of Fame at the National Infantry Museum in Fort Benning, Georgia on April 25, 2016. Judge Robert Morris, Second DCA, was recently named editor-in-chief of Judicature, the scholarly journal for judges published by the Duke Law Center for Judicial Studies. Retired Judge Frank A. Orlando, Seventeenth Judicial Circuit from 1968 – 1988, was selected for induction into the University of Florida’s College of Health and Human Performance Alumni Hall of Fame. He is being honored for a host of accomplishments, among them, since retiring from the bench, he has been instrumental in introducing juvenile detention reforms in Florida; has coordinated technical assistance for the Annie E. Casey Foundation for Juvenile Detention Alternatives Initiative; and has served as the director of the Center for the Study of Youth Policy at Nova Southeastern University School of Law. Judge Cynthia L. Cox, Nineteenth Circuit, received the 2016 Distinguished Judicial Service Award. This award honors outstanding and sustained service to the public, especially as it relates to the support of pro bono legal services. Judge Charles Francis, Second Circuit, received the Tallahassee Bar Association’s inaugural Lifetime Professionalism Award; the association’s highest honor, this award is presented to a lawyer, judge, or law professor who has exercised professionalism and staunch dedication to the legal profession for 25 years or more. Judge Ginger Lerner-Wren, Seventeenth Circuit, who presides over Broward County’s misdemeanor mental health court, has been appointed to serve on the Executive Committee of The National Action Alliance for Suicide Prevention. Established in 2010, this alliance is a public-private partnership advancing the National Strategy for Suicide Prevention; the organization aims to influence systems changes and target certain vulnerable populations who are at higher risk. The only judicial representative on a national committee comprising industry CEOs, members of congress, and federal agencies, Judge Lerner-Wren will help lead and advance suicide prevention awareness and promote evidence-based strategies to improve mental health and wellness throughout our nation’s court systems. Recently retired Judge Walter Logan, Sixth Circuit, was honored with the St Petersburg Bar Association’s 2015 Judicial Appreciation Award. Among the factors considered for this award are a nominee’s courtroom demeanor, judicial experience, helpfulness to lawyers and litigants, and activities off the bench that promote the administration of justice and civic participation. Judge T. Patt Maney, Okaloosa County, received the highest honor bestowed by the Brain Injury Association of Florida on behalf of thousands of brain injury survivors and their families. The Valiant Heart recognizes Judge Maney’s strength, courage, and leadership—evident in the way he confronted his own personal challenges as a survivor of traumatic brain injury and in his tireless advocacy for Veterans Treatment Courts in Okaloosa County and throughout the state. Judge J. Thomas McGrady, Sixth Circuit, was presented with the Clearwater Bar Association’s John U. Bird Judicial Excellence Award, which was established to recognize the recipient’s honor, high ideals, personal character, judicial competence, and service. Senior Judge Daniel R. Monaco, Twentieth Circuit, and Ms Deborah Mravic, Civil/Family Division Director in Collier County, were recognized for their exemplary service in the administration of Collier County’s residential foreclosure docket by the Thomas S. Biggs Chapter of the American Inns of Court of Collier County. The Inns of Court is a national organization of attorneys and judges committed to a shared national purpose of improving professionalism, ethics, civility, and excellence within the legal profession. Judge Edward Nicholas, Twelfth Circuit, was presented with the Bradenton Kiwanis Club’s Ralph Davis Fellow Award in recognition of his leadership and of his service to the Bradenton Kiwanis Club and the community. Ms Rose Patterson, chief of OSCA’s Office of Court Improvement, was honored with the President’s Award from the Florida Chapter of the Association of Family and Conciliation Courts for her service to the organization. Judge Mary Rudd Robinson, Broward County, was selected to serve as a trustee of the Florida Supreme Court Historical Society for a three-year term that began July 2015. The organization, which has nearly 1,000 members statewide, aims to apprise people of the importance of an independent judiciary and to preserve the history of the Florida state courts system. Judge Daniel H. Sleet, Second DCA, received the Jurist of the Year Award from the Tampa Bay Chapter of the American Board of Trial Advocates.Criteria for this award include a commitment to preserving and improving the jury trial system; being knowledgeable, prepared and ruling in a timely manner; following the rules of law and applying them evenhandedly; demanding professionalism from all lawyers; and maintaining an open and accessible working relationship with the trial bar. Judge Gilbert Smith, Jr., Twelfth Circuit, received the Bradenton Kiwanis Club’s George E. Hixson Fellow Award in recognition of his service to the Bradenton Kiwanis Club and to the community. Judge William R. Webb, Sixth Circuit, received the inaugural Judicial Professionalism Award from the Pasco County Chapter of the Florida Association for Women Lawyers. This award recognizes a local judge who best exemplifies service to the community, profession, and legal system and who has worked to inspire others to pursue a career in the legal profession. Judge Lauren L. Brodie, Twentieth Judicial Circuit, was named Woman Lawyer of the Year by the Collier County Women’s Bar Association. The Florida Dispute Resolution Center (DRC) proudly announces the award recipients recognized at this summer’s 23rd annual conference. Lawrence M. Watson, Esquire, received the Sharon Press Excellence in Alternative Dispute Resolution Award for 25 years of visionary leadership, professional integrity and unwavering devotion to the field of alternative dispute resolution. Mr. Watson served as chairman, Supreme Court Committee on Mediation and Arbitration Rules, 1989 – 2001; member, Supreme Court Committee on ADR Rules, 2001 – 2003; and member, Supreme Court Committee on ADR Rules & Policy, 2003 – 2014. Yale T. Freeman, Esquire, received the DRC’s Award of Appreciation for his hundreds of volunteer hours over four years as an expert advisor and drafter of Part III, Discipline, Florida Rules for Certified and Court-Appointed Mediators. And Irv J. Lamel, Esquire, received the DRC’s Award of Appreciation for his hundreds of volunteer hours over four years as an expert advisor and drafter of Part III, Discipline, Florida Rules for Certified and Court-Appointed Mediators. Retired Judge Charles D. Edelstein, Miami-Dade County, was presented with the 2015 Selig Goldin Award, an honor bestowed annually by Criminal Law Section of The Florida Bar. He was recognized for his long career (more than 50 years) as a lawyer and judge, during which time, he “touched—and improved—nearly every facet of the state’s criminal justice system.” In particular, he was singled out for his leadership in remedying the caseload backlog paralyzing court systems around the country, for spearheading reforms in caseload management practices, and for developing solutions to help alleviate prison overcrowding. Judge Ronald A. Flury, Second Circuit, was honored with the Conference of the County Court Judges of Florida 2015 Judge Harvey Ford Award; the highest honor presented by the conference, this annual award recognizes one county court judge for his/her dedication of service to the community, the legal profession, and the conference itself. Judge Charles A. Francis, Second Judicial Circuit, received the Jack McLean Champion for Legal Services Award; the award recognizes an individual, business, firm, governmental entity, or organization that has fulfilled the mission of Legal Services of North Florida by enhancing the provision of services and/or strengthening the ability of Legal Services to provide services. Judge Lee Haworth, Twelfth Judicial Circuit, was presented with a newly-established Chief Justice Award for Judicial Excellence, which recognizes one county court judge and one circuit court judge who personify judicial excellence and demonstrate exceptional commitment to the judicial branch. Judge Haworth was selected in part because of his leadership and innovation when the foreclosure crisis began to overwhelm Florida’s courts; his efforts to improve the lives of abused and neglected children who come in contact with the courts; his contributions to equal and fair funding of Florida’s court system; his work on adapting technological advances to the courtroom needs of judges; and his focus on meeting the needs of veterans struggling to find their bearings after their service to their country is over. Judge Nelly Khouzam, Second District Court of Appeal, was recently “tapped into” the Florida Blue Key Honor Fraternity, the oldest and most prestigious leadership honorary society in the state, as a member of the Spring 2015 Honorary Tapping class; her selection recognizes her outstanding ability, leadership, and service to the University of Florida and to the state of Florida. Judge Steven Leifman, Miami-Dade County, was presented with a newly-established Chief Justice Award for Judicial Excellence, which recognizes one county court judge and one circuit court judge who personify judicial excellence and demonstrate exceptional commitment to the judicial branch. Judge Leifman was selected in part because of his creation, in 2000, of the Eleventh Judicial Circuit Mental Health Project, which diverts people with mental illnesses who do not pose significant public safety risks into community-based treatment and support programs and because of his involvement in developing the nation’s largest Crisis Intervention Team Training Program, which has trained more than 4,400 law enforcement officers to recognize the signs and symptoms of mental illnesses and to respond more effectively and appropriately to people in psychiatric crisis. Judge Steven Leifman, Miami-Dade County, is the recipient of the 2015 William H. Rehnquist Award. Bestowed annually by the National Center for State Courts, this prestigious award is one of the country’s highest judicial honors; it recognizes “a state court judge who demonstrates the outstanding qualities of judicial excellence, including integrity, fairness, open-mindedness, knowledge of the law, professional ethics, creativity, sound judgment, intellectual courage, and decisiveness.” Judge Leifman was selected for his work helping people with mental illnesses who are in the criminal justice system or are at risk of incarceration: “Judge Leifman has built a national reputation for his pragmatic, collaborative, and focused approach to finding long-term solutions that improve people’s lives and the health of the community and the courts,” said NCSC President Mary McQueen. John G. Roberts, Jr., US Supreme Court chief justice, will present the award to Judge Leifman during a ceremony at the nation’s highest federal court on November 19. This year marks the twentieth anniversary of the Rehnquist Award, and Judge Leifman is the first Florida judge on whom the honor has been conferred. The Ninth Judicial Circuit Court website was honored with a “Top 10 Court Websites Award” bestowed by the National Association for Court Management. This award is given to courts that utilize technology to create easy-to-use, interactive websites that facilitate users’ ability to access public records and information on court services and programs. The Ninth Circuit recently updated its website to make information as easy to access as possible; updates include the provision of streamlined navigation for people using mobile phone platforms as well as a navigation redesign that enables users to find most of the information they are seeking within two clicks of the homepage. Judge John Phillips, Palm Beach County, was named the Justice Teaching Select Committee Judge of the Year. Since 2010, Judge Phillips has regularly visited Royal Palm School to share civics education with students with some of the most of severe disabilities in Palm Beach County; most of the students struggle with communicating, so he has created lesson plans and presentations that enable the children and teachers to interact with him. As a result of his work, the students have learned about Florida's justice system and laws and have developed their critical thinking and problem-solving skills, something that no other Justice Teaching partner has attempted to do with severely disabled children. Judge Vance E. Salter, Third District Court of Appeal, has been named one of the honorees in History Miami’s “50 Years, 50 Voices,” celebrating the 50-year history of Legal Services of Greater Miami and honoring outstanding community leader who helped shape that organization. Judge Margaret H. Schreiber, Ninth Judicial Circuit, was honored with the CFAWL Legacy Award from the Central Florida Association for Women Lawyers (CFAWL); this award is presented to a current member of CFAWL who has been a member for more than 15 years and who has demonstrated the highest levels of integrity, leadership, and service to CFAWL, the legal profession, and the community. Colonel Grant Slayden, Trial Court Administrator, Second Judicial Circuit, was most recently deployed in Washington, DC, where he served as US Army Commander of Task Force Artemis from April 2013 to April 2014. He commanded the ground-based air defense of the National Capital Region, responsible for over 300 personnel and accountable for equipment valued at over $47 million. Promoted and recognized for his service on August 7, 2015, Colonel Slayden will be taking over the 164th Air Defense Artillery Brigade. Judge Lisa Walsh, Eleventh Judicial Circuit, will take on a national leadership role this October, when she will be sworn in as the new president of the National Association of Women Judges. Marshal Veronica Antonoff, Third DCA, recently graduated from the Basic Law Enforcement Academy, housed in the Miami-Dade College School of Justice. This demanding, nine-month training program includes both classroom and physical abilities components. Judge Mark Blechman, Ninth Judicial Circuit, received the Citizen of the Year award from the Osceola County Veterans Council, which annually recognizes people whose innovative contributions to the community create awareness of and present solutions to a problem plaguing Central Florida residents; Judge Blechman was honored for spearheading the development and implementation of Veterans Court in Osceola County. Judge Kevin Emas, Third DCA, was elected to membership in the American Law Institute, which comprises 4,000 lawyers, judges, and law professors of the highest qualifications from 28 states and the District of Columbia. The institute drafts, discusses, revises, and publishes Restatements of the Law, model statutes, and principles of law that are highly influential in the courts and legislatures, as well as in legal scholarship and education.